K-pop boyband BTS makes history yet again as the first K-pop artist or the first pop group to address the United Nations General Assembly. 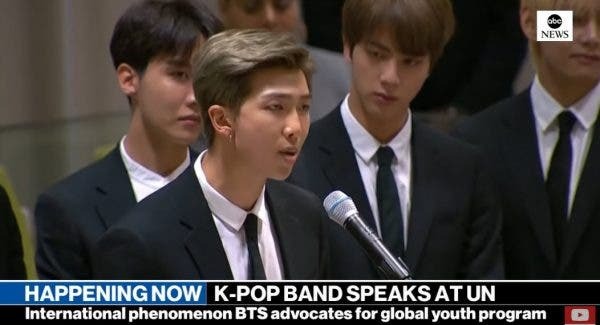 BTS, led by RM, gave an inspiring speech about self-love at the 73rd General Assembly of the United Nations on September 24, 2018 in New York City. “BTS has become artists performing in those huge stadiums and selling millions of albums, but I am still an ordinary 24-year-old guy. Maybe I made mistakes yesterday, but yesterday’s me is still me, and today I am who I am with all of my faults and mistakes,” he said. He continued by encouraging the young generation to stand up for themselves and take on global issues. “Let’s all take one more step. We have learned to love ourselves, so I urge you to speak yourself. No matter who you are, where you’re from, your skin colour or gender identity, speak yourself, find your name and find your voice by speaking yourself,” he added.